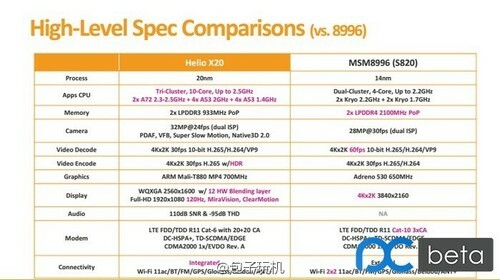 According to a leaked comparison between Mediatek's new 10-core Helio X20 SoC and Qualcomm's upcoming Snapdragon 820, the latter will be a quad-core SoC, albeit built on a more advanced process. More cores don't necessarily lead to better performance - dual-core SoCs like Apple's A8 and Nvidia's Tegra K1 (Denver) successfully compete with quad- , hexa- and octa-core models from Mediatek and Qualcomm. But while Mediatek decided to further increase the number of cores, having announced a new 10-core SoC called Helio X20 earlier this week, Qualcomm could be heading in the opposite direction. A leaked comparison between the Helio X20 and Qualcomm's next flagship SoC, the Snapdragon 820, claims that the latter will include only four processing cores. However, these cores will allegedly be built on a 14 nm FinFET process (most likely by Samsung), which should facilitate an increase in power efficiency and reduce heat generation. Instead of using stock ARM cores, Qualcomm will utilize its own ARMv8 architecture called Kryo, which should offer high performance-per-core. The four cores will be split into two clusters clocked at 1.7 GHz and 2.2 GHz, respectively. The SoC will support LPDDR4 memory clocked at up to 2100 MHz and should include Adreno 530 GPU running at 650 MHz. Additional features include support for LTE Cat. 10 (450/100 Mbps download/upload), Wi-Fi 802.11ac, GPS, GLONASS and BeiDou. The SoC will be compatible with Ultra HD (3840x2160 pixels) displays and cameras up to 28 MP. It will also allow recording Ultra HD videos at 60 fps. 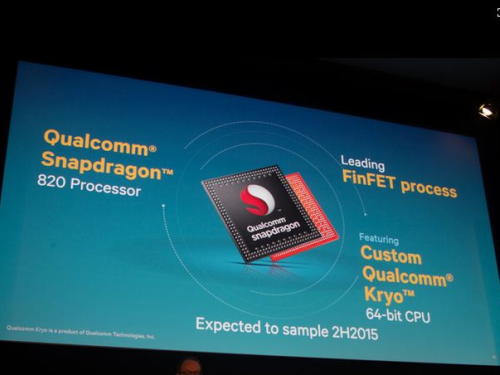 Currently, Snapdragon 820 samples are expected to ship to manufacturers in the second half of 2015. While Qualcomm is yet to reveal most of the new SoC's specifications, the company's announcement during MWC 2015 confirms that it will indeed utilize Kryo cores. Unfortunately, the presentation only claimed that a "leading" FinFET manufacturing process will be used, not specifying whether it means TSMC's 16 nm or Samsung's 14 nm.